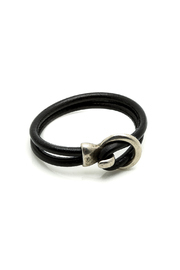 Supple black leather bracelet with silver-tone hook clasp. Fits average wrist. Can be ordered larger or smaller. Featured at RMNOnline Fashion Group (#RMNOnline).